The story is minimal. A bunny faces the reader and introduces himself. “I am a bunny. My name is Nicholas. I live in a hollow tree.” Disarmingly straightforward, he tells what he likes to do during each of the four seasons: pick flowers and chase butterflies in the spring, look at frogs and blow dandelion seeds in the summer, watch the leaves falling in the autumn and the snow falling in the winter. At the end, he curls up in his hollow tree and falls asleep. 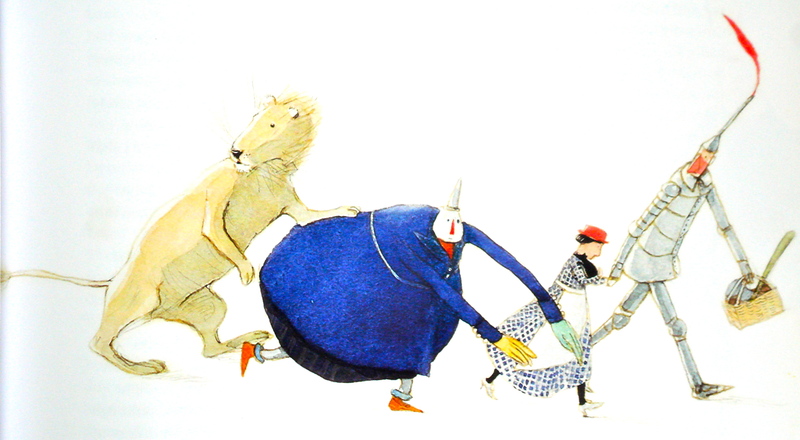 As with many of the Golden Books, the strength of I Am a Bunny lies in its rich illustrations. 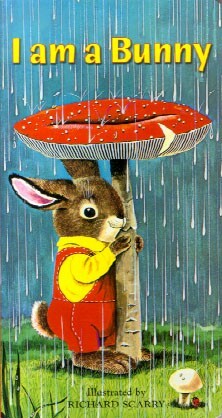 Ole Risom, the Danish art director for Golden Press during the 1950’s and 1960’s, invited his good friend, Richard Scarry, to collaborate on this book. There were several other books in this series, also written by Risom (I Am a Mouse, I Am a Puppy, I Am a Kitten), but the first stands apart. 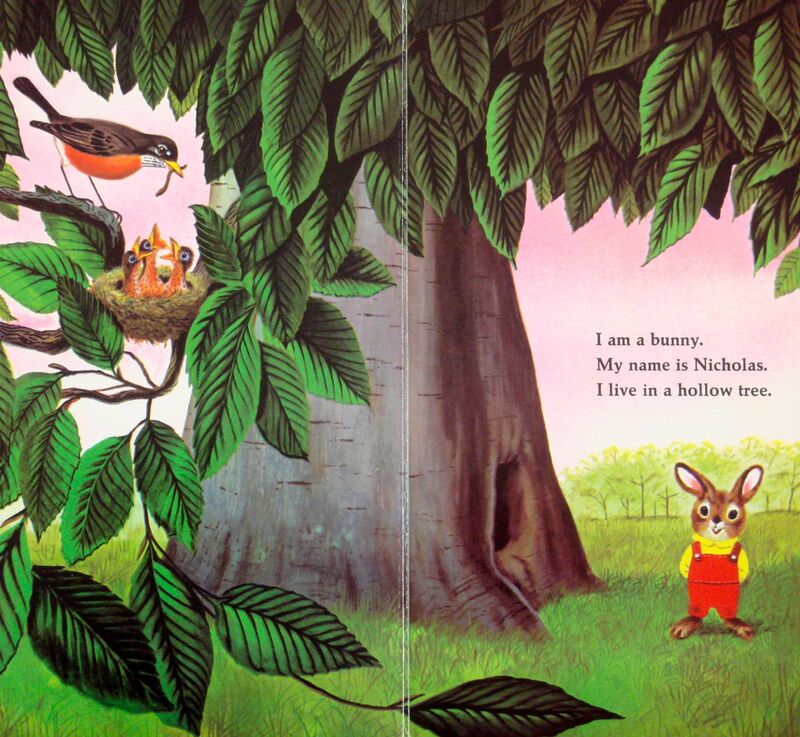 Richard Scarry was a prolific writer and illustrator, but this is arguably his most beautiful book. Nicholas (named for Ole Risom’s son) is a bright-eyed rabbit, dressed in a soft yellow shirt and red white-stitched overalls. On each page, through an interesting use of perspective, Nicholas is dwarfed by some element of nature which strikes us with its giant-sized detail in the foreground. Whether a robin feeding a worm to its young, a flowering dogwood, a swallowtail butterfly, or a trillium in bloom, each is presented with painstaking accuracy. In one picture, Nicholas cavorts with a swarm of colorful butterflies that cover the page (there are twenty four, each a different species) and in another, he is camouflaged by a swirl of autumn leaves, some larger than he. 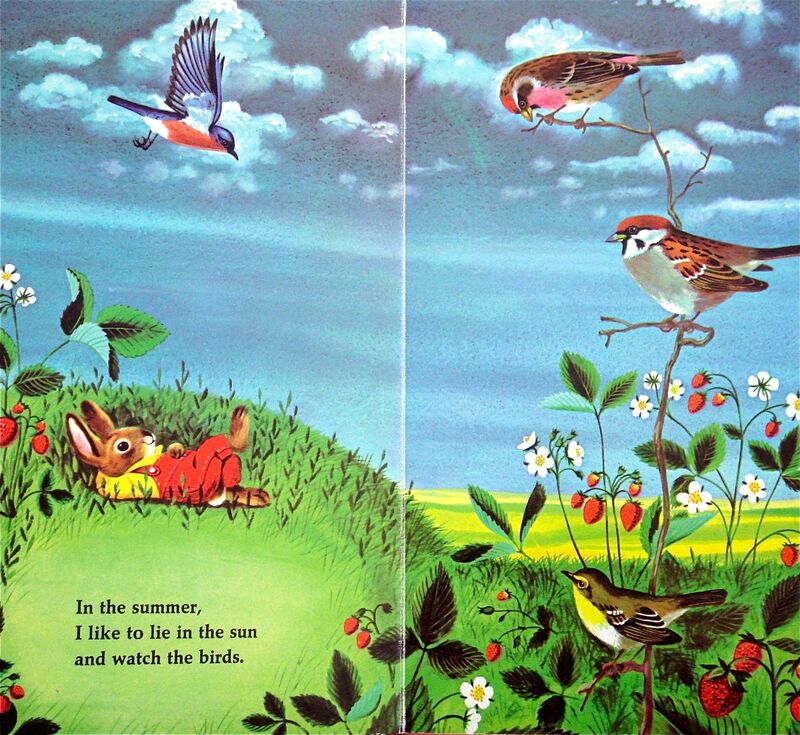 To illustrate, “In the summer, I like to lie in the sun and watch the birds.”, Nicholas lies on a grassy hill under cumulus clouds, ripe wild strawberries within reach, watching an eastern bluebird, common redpoll, Eurasian tree sparrow, and yellow-throated vireo. This is the perfect evocation of a lazy summer day in childhood, and one that would inspire anyone to go outside and lie down in the grass for awhile.